Because we saw a sign – we drove for about an hour – we saw a sign ‘Agra – 141 kilometers.’ And the driver – because you know, I am from Mumbai, I don’t know the roads here; actually, I don’t even know the roads in Mumbai – but we were driving and he takes a turn. I said, “Are we in Agra? Why are you turning off the highway?” He didn’t say anything. He said, “No, no. We must go this way.” We went that way and we kept going on that way. Two hours! And every time he saw someone, he was asking, “Where is Agra highway?” In Hindi, “Where is Agra highway?” We were completely lost, totally lost. We didn’t know where we were; we didn’t know where to go. He kept asking and asking and asking. We get directions, and then we get different directions and different directions. It’s dark and it’s late, and finally after two hours, we get off this road. I wouldn’t call it a road. I would call it some sort of path of purification. And finally, we came to another road which was also… but not so much. So we go this way, this way, this way, this way, this way and we see the highway, but we can’t get on. How to get on? This is material world. It’s right in front of us but we can’t get on it. Very, very symbolic. It’s right there. The highway was literally just a few meters from us and with a smooth nice eight lane. And we are just adjacent to it, and we are that far. We couldn’t get on it. So we asked some other directions and they said, “Where you came from, you have to go back ten kilometres. You are on the wrong way.” So we did that and finally we got on the highway. And then we came here. So why am I telling this story? I guess because I have to get it out of me! But there is a philosophical reason too. There wasn’t even any fog out last night. And we were totally lost. So the ‘fog’ means the fog of not knowing who we are, where we are really supposed to go, and how to get there. That, the Gita explains is knowledge. Tat param: “I am that eternal soul that is seeing through these eyes and hearing through these ears. I am sat-chid-ananda – I am eternal, full of knowledge, full of bliss. I am beyond birth, beyond death, beyond the vulnerable situations of this body and world. And I am part of Krishna. And there is love of Krishna within my heart. And this whole world is Krishna’s energy and this whole world can be a way that we express our love for Krishna.” That is truth. In that truth, there is real happiness. That is tat param. That is truth. And nothing can change that truth. 26 Responses to "The unchangeable truth"
We will not be disturbed by external circumstances when we develop inner peace. So true. Since our identity is that we are spirit souls, any amount of external arrangement cannot really make us happy and satisfied. Only when we re-establish our relationship with Krishna through service and only when Krishna reciprocated with our service can we be satisfied. Very nice explanation by HH Radhanath Swami. True, we are all immersed in the fog of delusion where we have forgotten our eternal connection to the Supreme Lord. It is only when we take shelter of the Lord and his devotees that we can begin to see our situation clearly. Thank you for sharing your story. Shelter of the Lord is the only solution to all problems. Wonderful article. 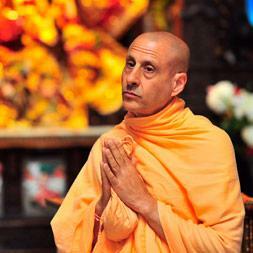 Thank you HH Radhanath Swami Maharaj Ji. Wonderful. Just few minutes before I was hearing today’s Sunday feast lecture at RGM, subject topic of lecture was similar, difficulties come at any time even in life of pure devotees like Yasodamayi and padavas etc. What we need to learn is to take shelter of the Lord Krishna. 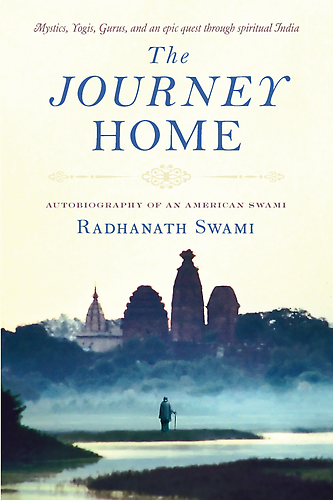 HH Radhanath Swami explains here to accept the final truth and take the complete shelter at the Lotus feet of the Lord. If it is difficult situation than we can pray for strength to tolerate it and if is good we can thank God for providing it. So taking complete shelter at the Lotus feet of the Lord is final master key. Thank you Maharaj for such a wonderful article! Wonderful explanation given by HH Radhanath Swami Maharaj Ji about truth. Thank you very much Maharaj for explaining about the real truth and how to derive happiness from the same. Thanks Maharaj for sharing such wonderful realization with us! Another beautiful article on Truthfulness. Earlier I read the article about Bali Maharaj. How being truthful he pleased Lord Vamana. The quote “It’s like truth and knowledge. It is right there in our hearts. But we don’t know how to get on it.”, is so true and relevant for almost everyone these days. We know but can get to it. Amazing realization from HH Radhanath Swami Maharaj. I’m grateful on reading this. Thank you. I agree, such a wonderful realization! Nice realised explanation by Radhanath Swami on never changing eternal truth, that we are eternally spirit souls, part and parcels of Krishna and our true happiness is based on serving Him unconditionally. You summarized it well. Thank you. I completely agree to this. Teachings are just superb. You don’t recieve this anywhere. Thanks a lot for sharing this with us. very inspiring experience. Radhanath Swami brings out nice realizations through every situation and accepts all the austerities as purificatory processes. Lot to learn from Him. Radhanath swami through his experience teaches us how to take a shelter of Krishna in any situation,especially the unfavorable.Quite inspiring. Thanks for sharing. we should know who we are , where we supposed to go & how to get their ..and to know this we should surrender to the bonafide spiritual master.